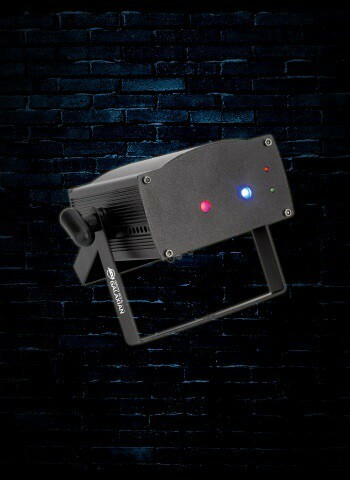 The Micro Galaxian from ADJ creates cool and tantalizing laser effects in red and blue while at the same time being lightweight, portable, and energy efficient. Perfect for the at DJ at home or on the road, or if you're looking to add to the ambiance of your bar or night club. Lasers are continuously becoming more and more prevalent in our daily lives. This has been all the more apparent in night life and festival culture. If you want to bring a musical entertainment experience that people are going to remember you need to have lasers. Lasers are cool, lasers are pretty, and most importantly, lasers are fun. Get your parties going with the Micro Galaxian from ADJ, a quality made product packed full of all the features, in a lightweight and easy to use package. You'll be wowing crowds every night with your light show, and solidifying yourself as a true participant in the laser future in which we now reside. Light up your nights with the Micro Galaxian Laser lights, another fine entertainment product from ADJ.